Ed. Note: Jeanie McIntyre is President of Upper Valley Land Trust and was a friend of Lebanon resident Laurel Letter, who died earlier this year. 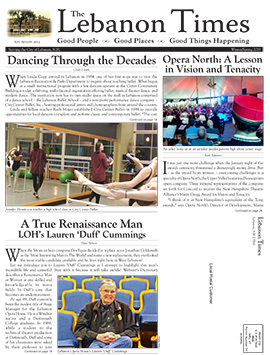 This article is adapted from the original published in March at uvlt.org. Laurel Letter was not a conservation leader. At least that’s what she would have said. She would say that she did not have expertise or confidence, she would ask for advice about next steps. She would offer to assist, to gather information. She would make it easier for others to lead – actually, she made it impossible for others not to lead. That’s how Laurel Letter made things happen. In the 1980s, Laurel knew her Young Street neighborhood in Lebanon as well as anyone, and she especially knew that a small patch of nature was wedged between the close blocks of homes and the Interstate highway. She treasured the importance of this little piece of forest and boulders, with its vernal pool and wetlands. So when the Upper Valley Land Trust came into existence, Laurel was one of our earliest visitors, with stories of children building forts among the rocks, and adults stepping into the woods for quiet evening walks. Laurel’s patch of nature was called “Starr Hill.” A portion of it was owned by the City of Lebanon, but there were two undeveloped tracts that belonged to a developer who planned to construct condominiums. 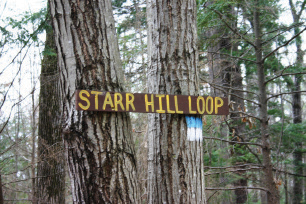 I was new at UVLT, and only working part time when Laurel got the idea to conserve Starr Hill. In those early years I’m sure there were weeks when she was in the office more than I was. To begin with, she first had to figure out what the city owned, which led her to research and map a catalog of all city-owned properties of conservation interest (no list existed at that time). Then she needed to explain to city leaders why the ownership at Starr Hill should be expanded and why it should be conserved. And how conservation easements work. And how it would be paid for (but that part comes later). To be honest, Laurel also had to persuade UVLT that the conservation of Starr Hill would be valuable. It’s not a big area and it doesn’t hold rare or unusual features – it’s not “charismatic.” But it is loved. That was the truth that Laurel presented every time she walked through our door. Laurel’s efforts went on over years. The property went on the market, there were legal notices about tax and mortgage delinquency, and issues about development capacity and city regulations. Laurel, ever optimistic, wrote letters and copied the legal notices. She would arrive breathless and cheerful in our fourth floor offices over Colburn Park, bringing us news and eager for her next assignment. She would depart for City Hall with a list of tasks and a happy smile. Back and forth. And then… it worked! And as the pieces came together, Laurel revealed her most incredible act of leadership. She and her husband Sid took out a second mortgage on their home in order for the acquisition and conservation of the Starr Hill property to proceed. They borrowed the maximum amount the bank would allow. The Conservation Commission approved a $10,000 expenditure from the city’s Conservation Fund. The deal was done. In the years that followed, few Lebanon residents knew that Sid and Laurel were making payments on the debt they bore for Starr Hill. The first time I monitored a conservation easement, I called on Laurel Letter. It was early November, hunting season. We walked all over Starr Hill together. She encouraged me to scramble up one of the big boulders so she could take a photo. We got cold in the wind where the property was more open. Then we returned to her modest home to warm up. We sat together and talked. The details of that day are memories that I treasure – Laurel’s pure joy in knowing that Starr Hill was secure for all time. Her humility, her generosity, her care for her neighbors. A leader by doing: gracious, modest, dogged, loving. Laurel Sherman Letter died on March 13, 2014. 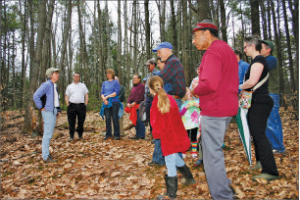 Community members who knew Laurel, love Starr Hill, support UVLT and conservation in Lebanon, or just wanted to get outside on Earth Day walked together in her memory at Starr Hill on April 22.